If you’ve ever had a toothache, you know it can bring your life to a screeching halt. Whether it’s constant or intermittent, a toothache is impossible to ignore. There are a few different sensations that can be labeled as “toothache” and some of the possible causes are a lot more serious than others. You may feel sensitivity to hot and cold foods and beverages, shooting pains, throbbing, or a low-intensity soreness. In order to understand toothaches, it’s important to understand the anatomy of our teeth. The part of the tooth we can see is referred to as the crown, and it is covered with enamel, which resists the forces of pressure and friction. Enamel makes our teeth strong enough to bite, grind, and chew our food and is naturally very resistant to the excretions produced by mouth bacteria. Below the gum line is the root, which does not have enamel to protect it from decay. Inside the tooth, the softer layer of dentin lies underneath the enamel, and within the dentin is the pulp chamber. Inside the the pulp chamber lie the blood, nerve endings, and other tissues that make teeth a living part of your body, unlike hair and nails. The nerves that reside in the innermost part of the tooth are what generally hurt us when we have a toothache. Only when the dentin or inner pulp chamber has been breached do we begin to feel pain. Nerves are also present on the surface of the roots, which may be exposed when gum tissue erodes, due to gum disease and/or decay below the gum line. Most toothaches are the result of dental decay (cavities), after the enamel has been penetrated by bacteria and they have made their way down to the dentin and pulp. For this reason, there is no such thing as a “minor toothache.” If there is any pain at all, the inner portion of the tooth has been compromised and is well on its way to needing a root canal treatment or extraction. Less severe cavities are those that do not extend past the enamel, and therefore do not cause any noticeable sensations. A tooth with a crack or fracture may also cause a toothache, even if there is not a great deal of bacteria and decay accompanying it. Often a dental crown can restore and protect a cracked or fractured tooth from further damage. 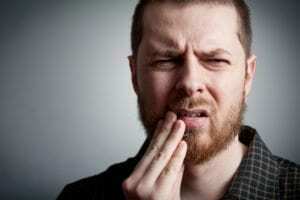 Severe pain may also be caused by an abscess, in which the infection spreads out from the tooth and creates a pocket of inflamed gum tissue nearby. If a toothache is ever accompanied by facial swelling and fever, this usually indicates an abscess. When left untreated, the infection may spread to other parts of the body, and lead to organ and blood infections, which can be life-threatening. Since dental work, such as fillings, crowns, and bridges often extend into the dentin, pain in a previously treated tooth may indicate the restoration has failed and needs to be repaired. Swollen gum tissue can also feel like a toothache, as is the case when a tooth becomes impacted and creates tenderness and inflammation in the surrounding tissues. Unlike most other parts of the human body, teeth have no mechanisms for self-healing. We often ignore small bodily aches and pains, in the hopes that they will take care of themselves and heal on their own—which they often do. This does not work with teeth, however. Once a cavity or crack has started, the tooth cannot repair itself. Untreated, it will only get worse. It’s a fact of human biology that pain thresholds may vary significantly from person to person. Not every toothache means you will need a root canal. The other side of this, however, is that a person with a naturally high pain threshold may ignore a “minor” or sporadic toothache, thus allowing a serious infection to worsen. For this reason, a toothache—any toothache—means only one thing: you need to get to the dentist as soon as possible if you want to save the tooth! Bring Your Toothaches to Us! At Metropolitan Dental Care, our team of dentists have the experience and qualifications to discover the source of your toothache and treat it appropriately. We use a number of diagnostic tools and procedures to determine the cause of your pain and deliver the restoration that best allows you to retain the function and appearance of the tooth. The best way to protect yourself from ever needing restorations, is to make dental examinations a regular part of your life. Scheduling six-month visits for preventive care gives us the opportunity to identify cavities in their earliest stages. If we can catch cavities and cracks early, you may never have to experience the agonizing pain of a toothache. If you have a toothache, or hope to avoid them in the future, call Metropolitan Dental Care at 303-534-2626 to make an appointment. When it comes to your teeth, prevention is better than cure! We proudly serve the Denver and Lone Tree, CO communities and provide friendly dental care for the whole family.